Get “up close and personal” while swimming with the dolphins in Riviera Nayarit. These beautiful, highly intelligent mammals are adored the world over. Pacific bottlenose dolphins can often be seen jumping, playing and even heard “laughing” in their natural ocean environment along the Pacific coast of Riviera Nayarit. You can find a number of unique programs for swimming with dolphin in Riviera Nayarit. Many are perfect for every age group and activity level. Interacting with dolphins in Riviera Nayarit is sure to create amazing memories that will last a lifetime. Swimming with dolphins in Riviera Nayarit is often referred to as “Dolphin Encounters” and offer a great introduction to dolphins. The experience starts with an overview of dolphin facts, touching upon dolphin history, behaviour, anatomy, habitat, and physiology. After the initial educational briefing you enter waist deep water where you are able to meet and get acquainted with the dolphins. You’ll be able to feel their smooth skin, feed them treats, use hand signals to communicate with them, and even exchange an affectionate dolphin kiss! Special dolphin encounters for children called “Dolphin Kids” are available for young children aged 4 to 8. The children can interact with the dolphins and provide mom and dad with unforgettable dolphin selfies, photos they will treasure forever. Step up the level of interactivity with a structured dolphin swim experience that provides the most time in the water with these incredible mammals. These dolphin swim programs combine a learning experience with extended face-to-dolphin time. You’ll get into the action where can you touch, feed, play, cuddle, and dolphin kiss this loveable creature. There’s even a “dolphin ride,” with incredibly affectionate dolphins that appear to enjoy their time with you, as much as you do with them. 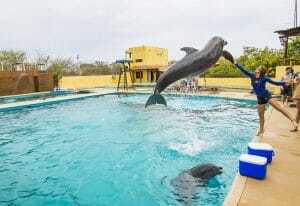 This safe dolphin training camp offers the ultimate dolphin encounter. It is designed for anyone who has ever dreamed about training marine mammals like dolphins, porpoises, or sea lions. This in-depth, sensational dolphin swim experience puts you alongside professional dolphin trainers for a full day. You’ll get hands-on experience, learning “signalling” (for handling dolphins) and the basic skills used in caring for and training dolphins. The Wild Dolphin Experiences are conducted with respect and awareness in their natural environment, the Pacific Ocean. You will learn a lot about them. You’ll even get to hear their songs with an hydrophone system and maybe share some time in the water with them! The Wild Encounter will depend on the nature forces and any other nature phenomenon. Watch a video on swimming with dolphins in Riviera Nayarit or explore some of our other Water Activities in Mexico’s Riviera Nayarit including sea lion encounters, whale watching and surfing.